Background: Migraine is an episodic headache, which is an endothelial disorder with neurological inflammation. Intercellular Adhesion Molecule-1 (ICAM-1), as an endothelial factor, leads to the adhesion of leukocytes to the walls of the cerebral blood vessels, which is an important step in the inflammation process. Curcumin and omega-3 fatty acids, by affecting transcription factors, can regulate the gene expression and serum levels of ICAM-1. Thus, this study aimed to evaluate the synergistic effects of ω-3 fatty acids and nano-curcumin on ICAM-1 gene expression and serum levels in migraine patients. Method: This clinical trial study was conducted on 72 episodic migraine patients in 4 groups for 2 months, with patients receiving ω-3 fatty acids, nano-curcumin, a combination of them, or a placebo during the study. At the beginning and end of the study, the gene expression and serum level of ICAM-1 were measured by real-time PCR and ELISA. Result: The results showed no significant change in ICAM-1 gene expression in any of the 4 groups. The ICAM-1 serum concentration in the combination group, and omega-3 alone, showed a significant reduction at the end of the study compared to the beginning. In addition, a significant reduction in attack frequency was observed in the combination group. Conclusion: Considering the results of supplementation with omega-3 fatty acids plus curcumin led to reductions of both attack frequency and ICAM-1 serum level in patients, it seems that supplementation with these two nutrients not only can lead to improvements in the function of metabolic pathways, but can also be used effectively as a treatment or prevention of migraine complications. Keywords: Curcumin, ICAM-1, migraine, ω-3 fatty acids, serum levels, migraine patients. Keywords:Curcumin, ICAM-1, migraine, ω-3 fatty acids, serum levels, migraine patients. Abstract:Background: Migraine is an episodic headache, which is an endothelial disorder with neurological inflammation. Intercellular Adhesion Molecule-1 (ICAM-1), as an endothelial factor, leads to the adhesion of leukocytes to the walls of the cerebral blood vessels, which is an important step in the inflammation process. Curcumin and omega-3 fatty acids, by affecting transcription factors, can regulate the gene expression and serum levels of ICAM-1. 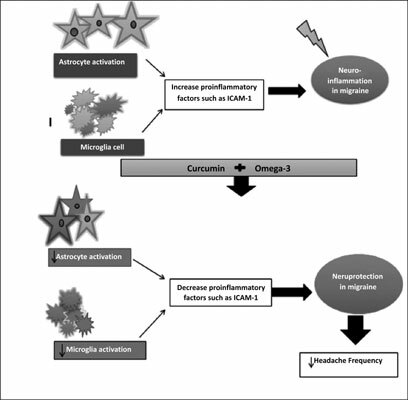 Thus, this study aimed to evaluate the synergistic effects of ω-3 fatty acids and nano-curcumin on ICAM-1 gene expression and serum levels in migraine patients. Cholinergic System Dysfunction and Neurodegenerative Diseases: Cause or Effect?